I want to finish my series about rhizo-ethics before Dave Cormier posts another #rhizo15 challenge. We'll see. Woermann and Cilliers' discussion of complex ethics in their article The ethics of complexity and the complexity of ethics (2012) insists that ethics in complex spaces requires a self-critical rationality and that this rationality is supported by four principles: provisionality, transgressivity, irony, and imagination, or creativity. Imagination engages us with the future, they say, whereas irony engages us with the present incongruity between what we expect and what is. They quote Peter Allen's Knowledge, Ignorance, and Learning article (caution: link downloads PDF): that creativity "is the motor of change, and the hidden dynamic that underlies the rise and fall of civilizations, peoples, and regions, and evolution both encourages and feeds on invention" (457). Imagination, then, points us toward a more sustainable future and provides the means to get there, and, they claim, "no one can contest the urgent need to move towards a more sustainable future" (457). It is this more sustainable future that seems to connect imagination to ethics for Woermann and Cilliers. I have mostly enjoyed Woermann and Cilliers' argument, but I have problems with them just here. While I agree that it takes imagination and some creativity to move toward a better future, however one defines it, I do not agree that "no one can contest the urgent need to move towards a more sustainable future." While I would not contest our need to move beyond where we are now, I know many who believe that things are pretty good just as they are or that we should, in fact, move back to something in the past. Woermann and Cilliers' point touches precisely on the differences among those who want to preserve society as it is, return society to some better past, or move society forward to a better future. All these groups are well represented in the population. They are all well represented in education. I don't think the progressives are in the majority. Still, despite these quibbles, I have learned from Woermann and Cilliers, and I do agree with them that imagination and creativity are important for ethically negotiating complex, open spaces. First, imagination is the engine for creating options, choices, and new paths, an ability that so far has served humanity quite well. Indeed, it is the engine of evolution, of everything. The Universe is imaginative to the extreme. Some physicists hypothesize a Multi-verse, an infinity of universes in which every thing that can exist and can happen does. Maybe so, but even if there is only one Universe, this one, it is still rich enough in imagination and creativity for life, including The Beatles, to emerge. How wonderful is that! This capacity for imagination—which is not limited to humans, by the way, but is available to flowers, rocks, and quarks as well—is a requirement for negotiating a space/time path through an open, complex universe. Or through a rhizo-MOOC. Imagination is required even if you are following a path pioneered by someone else. You have to imagine that you can get up and go there without falling off the edge of the Earth, so you draft in behind some trusted, lead bird, and once you are confident that the air won't fail beneath your wings, you can start charting your own path from this new position. This is learning. Even for the most daring and brilliant of us. We all start by drafting in someone's path. Without a John Clerk Maxwell charting a new path through electromagnetism, we would have had no Einstein. Maybe even no Beatles. Imagine! This is a radical over-turning of our usual conception of ethics, which usually means conforming to the prescribed pattern of behavior. In complex spaces, proper behavior implies the imagination to change your paths and patterns—to believe and behave differently than before. And really, if you are not willing to chart new paths, or at least to consider new paths, then why go to school at all? 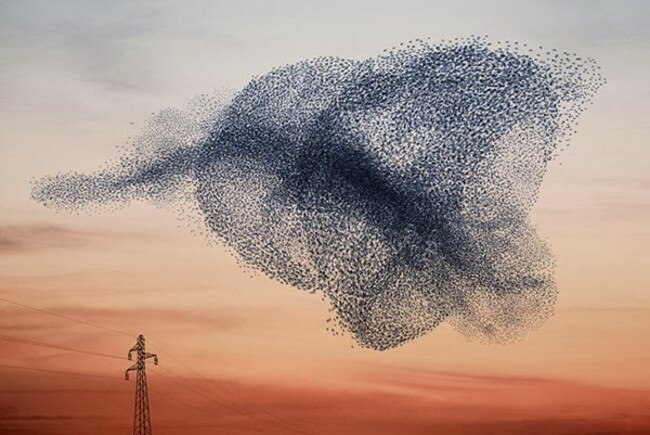 According to Woermann and Cilliers, Timothy Hargrave argues that imagination is not merely an individual capability, but a social one that, I say, is enhanced and amplified by the swarm. Hargrave says imagination and creativity emerges within "pluralistic processes in which multiple actors with opposing moral viewpoints interact, and [where] no single actor is in control" and within the "lived tensions between contradictory perspectives" (458). That sounds like a swarm to me. Again, this overturns our usual view of the purpose of ethics: to reduce conflict. Instead, complex ethics recognizes the inherent tensions within the multiplicity of a rhizo-swarm. Without this tension, no movement or change is possible. Ask the rocks along the San Andreas fault—without the tension among them, they could never move or change. In some ways, earthquakes are rocks learning to live together. Rock ethics. We can regret when their tensions spill over on us humans, but then, it should remind us of how much non-humans have suffered when our tensions spill over on them. Complex ethics are ecological—never limited to the contracting or conflicting entities. How do we ethically cope with this tension in human behavior and beliefs? The conservative approach is to make everyone behave and believe the same way. The Way. Complex ethics takes a more imaginative approach based first on recognizing the existence of different ways of believing and behaving. It's amazing how stubborn we humans can be about conceding the existence of views other than our own. We are always surprised when we discover that another person drives to the store along a different highway than we take. Can't they see that this is the correct Way? Rhizo-ethics, then, can conceive of different beliefs and behaviors. Then rhizo-ethics is tolerant, which as Woermann and Cilliers point out is not some wishy-washy, weak indulgence of strange belief and behavior. Rather, tolerance is an imaginative recognition of the possibilities of other beliefs and behaviors. Woermann and Cilliers rely on James Mensch's observation that "in Latin, tolerance has the sense of supporting or sustaining, rather than enduring or suffering" (459). They quote Edmund Husserl's definition that tolerance is when I affirm for the other "his ideals as his, as ideals which I must affirm in him, just as he must affirm my ideals – not, indeed, as his ideals of life but as the ideals of my being and life" (459). I want to add here that imagining other beliefs and behaviors is a call, even a challenge, to us to transgress or rethink our own beliefs and behaviors. Rhizo-ethics means the imagination to consider what different constellations in the sky might mean even if we keep to our own constellations. Mensch says that tolerance "can be understood as the attitude that actively sustains the maximum number of compatible possibilities of being human" (459). Finally, I think an imaginative rhizo-ethics involves trust. We usually think of trust as interpersonal, but consider it first as ecological. We must trust first that a minimum "requisite diversity" is "needed for a system to cope with its environment" (457) and that some excess diversity is "needed for long-term systems survival, since the ‘fat’ of excess knowledge and diversity is needed both for breaking out of our conceptual schema and for imagining, and thereby experimenting and innovating for the future" (458). We humans are here because of the excess diversity in some cyanobacteria that emerged a few billion years ago. That bacteria existed because of the excess diversity in some nucleotides that lead to RNA. Trust diversity. It has worked magnificently well ever since hot gases started clumping into stars and galaxies. Likewise, mistrust anyone who claims that they know what we all should believe and how we all should behave. They do not have our best interests at heart. So rhizo-ethics says that the proper stance toward a complex, open space calls for imagination and creativity. We do not know The Way through, and at times, we must imagine a path where none exists. We must expect others to follow other paths, to already be on other trajectories with different subjectives in mind. We must expect different beliefs and behaviors and challenge ourselves to understand them, even if we do not accept them. We must expect that our own beliefs and behaviors are as strange to them and as difficult to understand. Ours is not the only way to model a useful, beautiful, and productive world. It may not even be a comparatively good way. And Dave posted a new #rhizo15 challenge last night, so I didn't finish this in time (whatever that means), but it doesn't matter, as I think I have one more rhizo-ethics post to write anyway. I will eventually return to finish my series of posts on ethics in MOOCs, or swarm ethics, or rhizo-ethics, but Dave Cormier has issued a second challenge for #rhizo15, and I want to respond. Measuring has always been problematic for me, in part I suppose because of my discipline: writing. I do not approve of counting writing as a way of assessing students' abilities to write. A 76 on an essay has always struck me as meaningless and wrong-headed, and my readings in complexity theory cause me even more concerns. For instance, I'm currently reading Timothy Morton's challenging book Hyperobjects: Philosophy and Ecology after the End of the World (2013). Morton, by the way, is an English professor at Rice University who seems to share some of my own interests. At any rate and without getting into the meaning of hyperobjects themselves, which I'm not yet ready to discuss, Morton makes some interesting observations about the problems of observation and measurement in relativistic and quantum sciences. These ideas resonate with me. There are no complete observations, whether by human or instrument. Thus, there are no complete measurements. At best, measurements are adequate, but this always introduces the question: adequate for what? In education, especially, we can never have complete confidence in our measurements of our fourth-grade boy, and we must always revisit our reasons for taking the measurement in the first place. Any measurement of our fourth-grader will, at the same time, reveal and hide salient aspects of the student. We ignore those hidden aspects at peril to both ourselves and the student. Then Morton notes that measurements always entangle the observer with the observed. This entanglement is very problematic. Morton says, "[Nils] Bohr argued that quantum phenomena don’t simply concatenate themselves with their measuring devices. They’re identical to them: the equipment and the phenomena form an indivisible whole" (Kindle Locations 760-762). This should sober all of us, if not frighten the piddle out of us. Let's say this more practically: In some important sense, I become what I measure—both the things I measure and the tools with which I measure—and my tools and the things I measure become me. We all become entangled in a larger identity (this starts suggesting, I think, what Morton means by hyperobjects, but I'm not pursuing that here). If I measure our fourth-grade boy with a standardized test, then I become that test and that boy. I do not mean that I become ONLY that test and that boy, but that test and boy become entangled in my identity—indeed, for the boy, that test may be all that I am to him. There is no meta-language or privileged position outside the entanglement of me, test, and boy from which I can safely conduct my measurement. If I measure, then I am included in the measurement. In education, we should choose our measurements most thoughtfully, for we become our measurements. Moreover, our students become our measurements. That is an awful burden. This entanglement suggests to me that any measurement changes the observer, the instruments, and the observed, and this change feeds imprecision back into the incompleteness of observations and measurements. The act of observing our fourth-grade boy changes that boy. He would have been different if not measured. Of course, the boy—along with everything else—is constantly observed and measured by other objects, and that constant observation and measurement and its resulting entanglement is in part what makes the boy what he is. In some sense, then, we cannot avoid making observations and taking measurements of others or being observed and measured in turn, but we seem to have some freedom in choosing the kinds of observations and measurements that we make. We should choose wisely. I wish I knew what was wise. Of course, I am not suggesting here that education is in any way special. We all constantly measure our worlds, if only informally and loosely: that's more, this is less; you are prettier than he; you are big, you little; this is near, that is far away; you have more money than I. Counting numerically is more precise and handy than counting in natural language, but Morton is reminding us that measurement, counting, is not the benign activity that we imagine it to be. It implicates and entangles. What counts in life is what we count and how we count it. Counting has two entangled meanings here: enumeration and evaluation. We count what counts, and what we count comes to count. Awareness of this entanglement is not new, I think. In his Sermon on the Mount, Jesus says: "Judge not, that ye be not judged. For with what judgment ye judge, ye shall be judged: and with what measure ye mete, it shall be measured to you again" (KJV Bible, Matthew 7:1,2). This passage is usually read as a moral lesson to avoid hypocrisy and censure, but I think we can give it a more profound reading: what and how you count determines how you yourself count. Perhaps the spiritually advanced among us, the deep meditators of the various religious and philosophical traditions, can measure without judging and without becoming their measurements, but I cannot. If I want to know who I am, then I can get a reliable read by noting what and how I measure my world, especially others, and how I assess the value of those measurements. That stuff counts. I don't think comma faults count much, so I don't count them, but I know people who do. A comma fault—what a sad thing to become. It's really hard to have a pleasing conversation with someone who's always correcting your grammar, so I usually don't. What do you measure? Dave Cormier has a fine way of challenging people to think outside their boxes, or outside any boxes. In the first week of Rhizo15, he has challenged us to think about our learning subjectives for the course. Of course, he's playing on the penchant of education for learning objectives, and I could glibly say that I'll let him know when I find them. In any rhizomatic course, objectives are often emergent outcomes, as Simon Warren notes in his marvelous post Emergent Outcomes from a Field of Weeds, and we should sustain the equanimity to remain open to those emergent outcomes, but starting with some subjectives—even objectives—can be helpful if we don't allow them to trap us. I think subjectives are a bit like DNA. In becoming a person, it's really helpful to have had some DNA to kick start the journey toward becoming who you are and who you will become, but you really can't let that DNA trap you. DNA, for instance, provides you gender, but if you limit yourself to whatever that characteristic is supposed to mean or if some group limits you to that, then you then you short-circuit yourself. My DNA made me a male, but I'll be damned if I'll be limited to what male means in my society and in my head. My job is to push boundaries, to transgress, to wander, and to develop the patience to see what emerges. But I also have to accept that whatever emerges for me, it will emerge in part from my being male. But—and here is what I'm hoping to learn more about in Rhizo15—I don't wander alone. Indeed, I'm coming to see that wandering alone is something of a Romantic myth concocted to glorify the individual. I am developing a deep and abiding appreciation for the rhizome, the learning community, the swarm. I must define myself incorporating the cold, brute genetic and social material I started with, and that responsibility is mine to accept or to ignore, yes—but there is no definition aside from, or independent of, the environment in which I emerge. I define, but I do so within my swarms. All my swarms. Edgar Morin taught me this lesson, but I express it most easily in terms of my own field: writing. I've used this example before, but it is worth repeating here. Consider the period (full stop in the UK), that tiny bit of end punctuation. All alone on a line, the period is reduced to its base DNA, if that: a "punctuation mark placed at the end of a sentence" (Wikipedia). That doesn't mean much, and if the period limited itself to its DNA, it wouldn't mean much, but arrange the period in a swarm of words such as this blog post, and it proliferates, it unpacks, it becomes much more than a silly dot at the end of a sentence. The period, of course, brings its DNA to a text, but within the text it enlarges, it moves beyond its boundaries. It becomes what it can be. All by myself, I don't mean much, but in my swarms, I proliferate and unpack. I am father, husband, child, brother, employee, teacher, scholar, learner, friend, joker, traveler—all those things, and more, but only within a swarm. I use the term swarm foolishly perhaps. 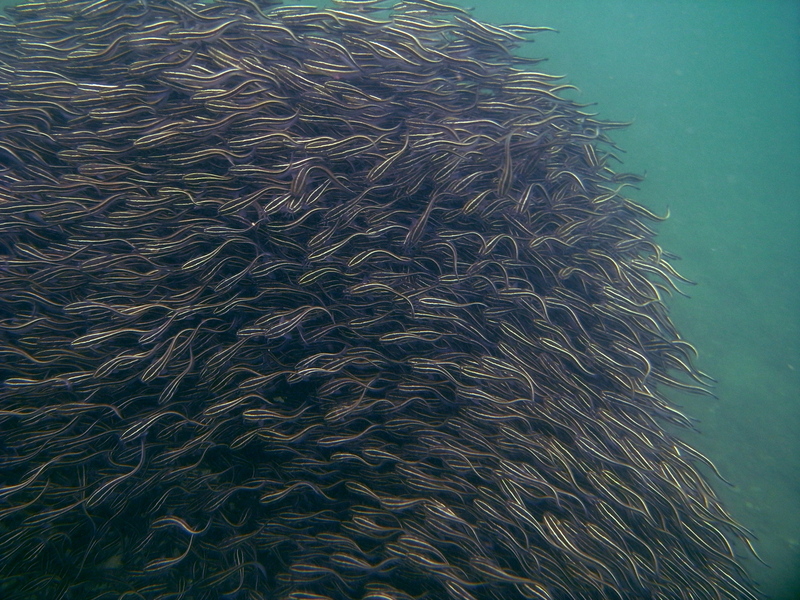 Most people don't like swarms, which feature prominently in horror movies. Swarms characterize all those groups of things that lose their individual identity and menace us. Read most any American account of the Korean War, and you'll almost certainly find a reference to a swarm of Koreans or the Chinese horde. They are not nice words. But my reading into recent studies in swarms suggests that all those ants, bees, starlings, and fish are not identical and they are not all robots doing the same things. They follow their own trajectories within the context of their surrounding neighbors. It appears that following your own path within the constraints of your chosen communities has great affordances. My subjective, then, is to learn more about how to cultivate the rhizome, the swarm—to find my path within the constraints of Rhizo15. I've been able to go some new places and think some new things because I have followed my path through this community. My path has influenced others and has been influenced in turn. It is both my path and the path of the swarm at the same time. I want to understand better how and why that works. I'm still exploring Woermann and Ciller's discussion of complex ethics in their article The ethics of complexity and the complexity of ethics (2012). I have found it to be such a rich line of thought, and now Rhizo15 is starting. Actually, I think this is a fine time to write this particular post. They posit four operations, or mechanisms, that support and make possible a self-critical rationality, and I've written about the first two: provisionality and transgressivity. In this post, I will tackle irony and humor as an approach to behavior in complex spaces such as MOOCs. Imagine yourself in a dense fog at night on a poorly lighted street corner in a big city. You cannot shake the sense that something big is about to happen, but you don't know what it is. You hear sounds from every direction—some appealing, some not, most just ambivalent street noises. You can see vague lights of every color somewhere beyond your cone of light, though your own little light obscures most of them. Things move in the distance. You must decide to stay put or move. Decide now. The point for Woermann and Cilliers, I think, is that we are all in a fog on a poorly-lighted street corner. In most situations, what we confidently know is dwarfed by what we do not know, certainly in complex situations such as MOOCs present, and we can either be scared shitless, or we can see the ironic humor in our condition and make our choices with the full understanding that we do not completely know what we are doing. Woermann and Cilliers argue for ironic humor, an alert ironic humor. They seem mostly to use irony as "a demonstration of incongruence between what is expected and what is" (455). This incongruence is the slippage between what we know and what we don't know and in the interactions between our knowledge and ignorance. We often seem to think that—or at least to act as if—what lies beyond our little street corner of knowledge does not affect us. This is not so. Complexity demonstrates that very little in reality is closed to outside influences, whether known or unknown. We try to build black boxes that do not interact with the outside, that are perfectly hermetic, but we always fail. All boxes leak, and the unknown always feeds into the known, perturbing our knowledge in mysterious ways until what starts as little slippages becomes a landslide, and we have to transgress our boundaries, expand our knowledge, to account for the perturbations. Irony helps us to cope with the uncertain results of our choices, and this uncertainty extends far beyond our lack of complete knowledge of any situation when making our choices. The uncertainty really begins after we've made our choices. In her 2010 doctoral dissertation, A Complex Ethics: Critical Complexity, Deconstruction, and Implications for Business Ethics, Woermann references what Edgar Morin calls "the principle of ecology of action". Woermann says, "as soon as an action is taken, it begins to escape from the intentions and will of its creator, and is taken up in a network of interactions and multiple feedbacks, which deprives it of finality" (212). In other words, all our actions reverberate, proliferate, amplify, and wander. They blow back. Once we release our actions into an ecosystem, they unpack in ways that we cannot completely predict or control. Anyone who communicates publicly is familiar with this capricious behavior of our pronouncements, for instance. My father, a Christian minister, often shook his head in amazement when members of his congregation congratulated or criticized him on some point in his message that he was certain he never made. If you speak in a MOOC, someone will misunderstand you. If you don't speak, someone will misunderstand you. How can you not see the irony in this situation? Or the humor? Humor is a step beyond irony, a step that I am too willing to take, but it is a tricky position to take in a MOOC, or most any other open system. Humor is too easily misunderstood and too quick to give offense. Much of humor exploits the incongruence between what is expected and what is, and it works when that incongruence is sudden and somewhat surprising. In other words, humor depends on playing with people's beliefs and boundaries and pushing them beyond those boundaries. Almost everyone has beliefs and boundaries that they are not willing to challenge except under the most carefully managed circumstances, if at all. You can't make jokes about those boundaries without starting a fight. Humor works best, perhaps, as a stance toward the pronouncements and behaviors of others. Keeping a sense of humor means recognizing that the other says things and acts from as confused a position as you do and with no more control over the consequences of their acts and pronouncements than you have. Practice the most humor with those who are the most confident that they are absolutely correct. They need all the humor you can bring. Irony and humor, then, weave into our behavior and thought processes an appreciation for the impossibility of our situation: we don't know enough to make decisions with absolute confidence, and even if we did, we cannot determine the results of those decisions once they enter a complex space. Still, we must make decisions. We must act. Like all of life, our actions are probabilistic in nature, and while we can work hard to increase our chances, we will all have some fortunate successes and ample failures. Just keep a sense of humor about it, both for yourself and for others.